I believe this to be true. I can’t help but notice the voices in my head respond differently depending upon what I’m reading. A well-written book nourishes my mind, stimulates my ideas and inspires me to write. Of course, if you want to be a good writer, you should read good writing, right? That is so much easier said than done. What is good? Good is subjective and oftentimes hard to describe. One person’s “good” is another’s waste of time. As much as I hate to waste my time, there are benefits to be found from reading a bad book. 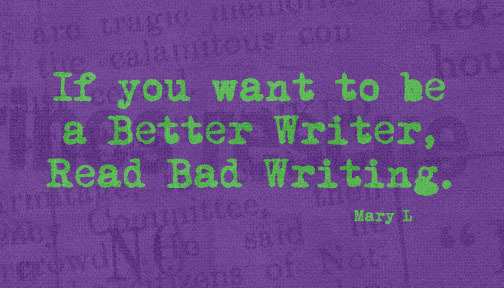 I think if you want to be a better writer, read bad writing.